پورسرتیپ, لادن, پورطهماسی, کامبیز, براونینگ, آخیم, اکشتاین, دیتر. (1392). تحلیل شبکه گاه‎شناسی درختان بلوط با اقلیم جنگل‏های هیرکانی. مجله صنایع چوب و کاغذ ایران, 4(2), 91-100. لادن پورسرتیپ; کامبیز پورطهماسی; آخیم براونینگ; دیتر اکشتاین. "تحلیل شبکه گاه‎شناسی درختان بلوط با اقلیم جنگل‏های هیرکانی". مجله صنایع چوب و کاغذ ایران, 4, 2, 1392, 91-100. پورسرتیپ, لادن, پورطهماسی, کامبیز, براونینگ, آخیم, اکشتاین, دیتر. (1392). 'تحلیل شبکه گاه‎شناسی درختان بلوط با اقلیم جنگل‏های هیرکانی', مجله صنایع چوب و کاغذ ایران, 4(2), pp. 91-100. پورسرتیپ, لادن, پورطهماسی, کامبیز, براونینگ, آخیم, اکشتاین, دیتر. تحلیل شبکه گاه‎شناسی درختان بلوط با اقلیم جنگل‏های هیرکانی. مجله صنایع چوب و کاغذ ایران, 1392; 4(2): 91-100. Rozas, V., 2003. Dendrochronology of pedunculate oak (Quercus robur L.) in old-growth pollarded woodland in northern Spain: tree-ring growth responses to climate,Annals of Forest Science, 62(3): 209-218. Fritts, H.C., 1976. Tree rings and Climate, Academic Press, London, 567 p.
 Arnold, D. H., and Mauseth, J. D., 1999. Effects of environmental factors on development of wood, American Journal of Botany, 86: 367–371. Eilmann, B., Weber, P., Rigling, A.,andEckstein, D.,2006. Growth reaction of Pinus sylvestris L. and Quercus pubescens Willd. to drought years on a dry site in Valais, Switzerland, Dendrochronologia, (23): 121-132. Arrigo, R. D., Yamagushi, D., Wiles, G. C., Jacoby, G. C., Osawa, A., and Lawrence, D. M., 1997. A Kashiwa oak (Quercus dentata) tree-ring width chronology from northern coastal Hokkaido, Japan, Canadian Journal of Forest Research, 27(4): 613-617. Fritts, H.C., 1962. The relation of growth ring widths in American beech and white oak to variations in climate, Tree-Ring Bulletin, 25(1-2): 2–10. Pan, C., Tajchman, S.J. and Kochenderfer, J.N., 1997. Dendroclimatological analysis of major forest species of the central Appalachians, Forest Ecology and Management, 98(1): 77–88. McCarthy, B.C. and Bailey, D.R., 1996. Composition, structure, and disturbance history of Crabtree woods: an old-growth forest of western Maryland, Bulletin of the Torrey Botanical Club, 123: 350–365. Balapour, SH., Asadpour, H., Jalilvand, H. and Raiini, M., 2008. The effect of climatic factors on annual Growth of Quercus trees in the forests at neka choob manegment region, International Sari symposium. 66-55. (In persian). Čufar, k., Prislan, P., Zupančič, M., Krže, L., de Luis, and M.,Eckstein D., 2009. Current stand of oak (Quercus spp) and beech (Fagus sylvatica) dendrochronology in Slovenia, Euro Dendro 2009 symposium. Poursartip, L., 2006. Dendroclimatological investigation of Juniperus polycarpos and Quercus macranthera in chahar bagh region, M.Sc. 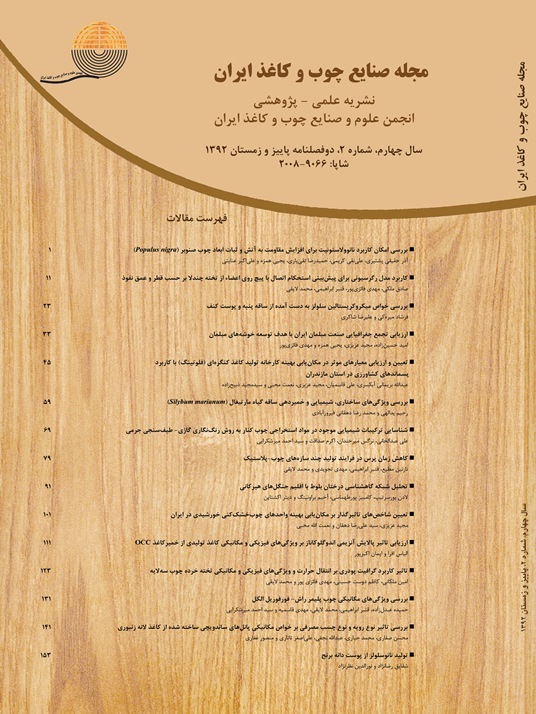 Thesis., Natural resources faculty of Tehran University. (In persian). Garcia-Gonzoalez, I. and Martinez, A., 2004. Climatic response of the early wood width of oak (Quercus robur L.) in the North-Western Iberian Peninsula, Departamento de Botanica, Escola Politécnica. Lebourgeois, F., Cousseau, G. and Ducos, Y., 2003. Climate-tree-growth relationships of Quercus petraea Mill, Stand in the Forest of Bercé, Futaie des Clos, 2004: 61 361–372. Papadopuolos, A., Tolika, K., Pantera, A. and Maheras, P., 2007. Investigation of the annual variability of the ALLEPO pine tree- rings width: The relationships with the climatic conditions in the Attica basin, Global NEST journal, (11): 583-592. Tardif, J.C. and Conciatori, F., 2006. Influence of climate on tree rings and vessel features in red oak and white oak growing near their northern distribution limit, southwestern Quebec, Canada, Canadian Journal of Forest Research, 36: 2317-2330. Saderi, M., 2010. The study of cambium activity and the formation of juniper’s wood in high elevation of chahar bagh region, M. sc. Thesis., Natural resources faculty of Tehran University. (In Persian). Nishimura, P.H. and Laroque, C.P. 2011. Observed continentally in radial growth-climate relationships in the twelve site network in western Labrador,Canada, Dendrochronologia,29:17-23. Linan, D., Buntgen, U,. Gonzales roco, F., Brunet, M., Zorita, E., montaves, J.P., Gomez, navarro J.J. and Brunet, M., 2012. Estimating750 years’ temperature variations and uncertainties in the Pyrenees by tree-ring reconstructions und climate simulations, Climate of the past, 8: 919-933. Mundo, I.A., Masiokas, M.H., Vilalba, R., Morals, M.S., Nukom, R., Cuns, C.Le., Urotia, R.B. and Lara, A., 2012. Multi-century tree-ring based reconstruction of the Nequen River streamflow, northern Patagonia, Argentina, Climate of the past, 8: 815-829.